There are ~40,000 oceangoing cargo ships in the world fleet. Ships are designed to last 30 years, so ~3.3% of this fleet should be replaced every year. In practice, ships last longer than 30 years and only ~2.0% of the fleet is replaced every year. To keep pace with world trade, the capacity of the cargo fleet needs to grow by ~2.8% a year. In practice, ships get bigger and more efficient, and only ~2.0% of the fleet is added every year. 4% of 40,000 is 1,600 ships a year: the number actually built fluctuates in a 30-year cycle. “All Other” includes car carriers, ferries, reefer ships and multi-purpose cargo ships, which are small compared to the other types but are more valuable on a per-ton basis. LNG carriers are a small sector of the market in terms of # of ships and GT but are much more valuable on a per-ton basis. 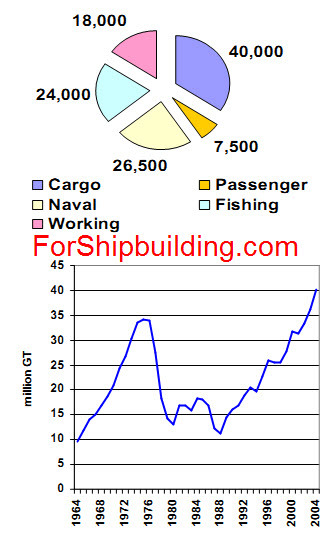 72% of the world cargo fleet (by # of ships) but 90% (by dwt) is built in the Far East. CGTs are “compensated” GTs – i.e., GTs multiplied by a factor that reflects relative complexity. “All Other” is mostly Europe, Brazil and India.